It’s two days before Christmas (and one before the first night of Chanukah). Anticipation is in the air. 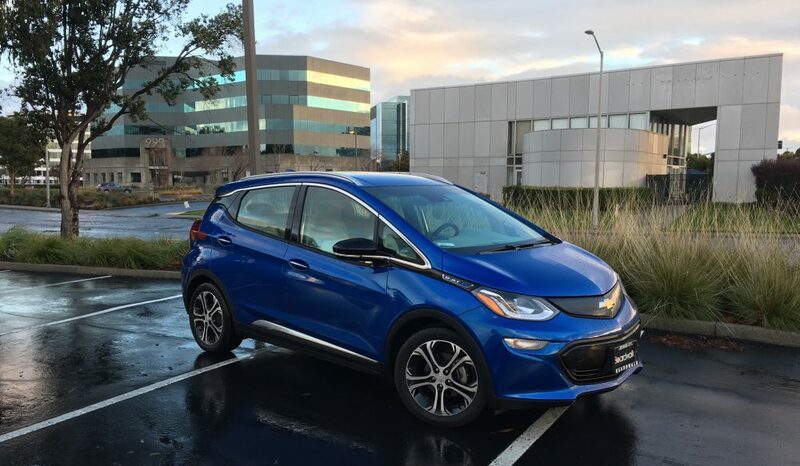 But I’ve been in a state of anticipation since October 11, when I ordered my Chevrolet Bolt. As an auto writer, I’m always driving someone else’s car for an article, but I decided that this car is the one I want for me. I think it will be ideal for my needs–even if I’m only spending part of my time driving it. What I’m trying to learn now is patience. It’s one thing to walk into a dealership, stroll around the lot, find a car you like, and then sit down and negotiate to drive it home. It’s another thing to order a car you’ve never actually seen or even driven and wait. You hope it’ll be as good as you’ve heard. I did manage to get down to the San Francisco Auto Show in November and see a Bolt (see photo above). It was, amazingly, the same color I ordered, and I walked around it, talked with people about it, sat in it, got out, sat in it again, and hovered around it for a while. I also visited a dealership and drove one. I was pleased that the experience behind the wheel (and in the back seat) was as good as I’d hoped. Having the car win awards right out of the chute was encouraging, too, making me feel like I was making the right choice. The ordering process itself was simple. I went into the dealership and specified what I wanted–color, features, etc. Then, I waited to hear that the order was submitted. Then, I waited to be informed that the factory had received it. After that, it took a while to find out that the factory was preparing to build the car. Then, I learned that it was built but awaiting transport. Today, I found out that my Bolt is on its way to California on a train. When it arrives here, it’ll go to a distribution center to be checked out before being trucked over the dealership. When it’ll arrive at Boardwalk Chevrolet in Redwood City is uncertain, but my great salesman emailed me today he may be able to track the progress of the train. That should be interesting. I wish they could show you your car being built at the factory. I wish they put a little camera with a homing device on it, so you could follow its progress. We’re used to tracking our Amazon purchases from the moment it’s shipped to the minute it lands on your doorstep, so what do you say, Chevy? Am I being obsessive? I still have a schedule of test cars into the middle of January, and am not giving up my column. But this is only the third time I’ve ordered a car–the second one for my own use–and it’s taking longer than I thought. It’s definitely a team sport. The Chevy Bolt EV Owners Group on Facebook is approaching 1,000 members. I expect not every single person in that group will sign a purchase agreement or lease, but there’s a real groundswell of interest. As a journalist, I’m hoping to put a real public face on this car, and I plan to take it as far as it’ll go. A few days ago, I ordered my home charger from ChargePoint. I’ll get it installed and ready for when I need it. I’m hoping to open up some space in my garage during the holiday break, but I’m getting a long enough cord that it’ll reach outside too, if necessary. Meanwhile, on Sunday, my family will open gifts, and we’ll have a great time together. But my real gift is still on its way. The exquisite pain of waiting makes it all the more exciting. As electric cars go, the Tesla, particularly the groundbreaking Model S, is the pinnacle of style and performance. But in its rear-view mirror, here comes some serious competition—the Lucid Air. If you’ve never heard of Lucid, that’s not a surprise. Even those of us in the car writing business have heard little. The company renamed itself recently, and they’ve been working quietly to produce not just a concept and a plan, but a real car. I saw it yesterday, and rode in a test version, and it’s the real deal. Per Zak Edson, Lucid’s Director of Marketing, the car world is stagnant today, with a wide variety of choices that don’t provide a complete experience. The Lucid, however, is designed from the start to combine the feel of a luxury car, the performance of a sports car, and the urban maneuverability of a midsize sedan—all in one vehicle. The Air, Lucid’s sole car at this point, is meant to relate to you, and be a seamless, personal experience. It’s a new kind of car, a segment-breaker, that is Mercedes E-Class sized on the outside for easy maneuverability, S-Class sized inside, and low and sleek like a sports car. It’s a no-compromise proposition, designed to give you back your energy, space, and time. Inside, rather than presenting you with a large screen like in a Tesla, the Air gives you an update on the familiar instrument panel, but with more. It’s configurable, and it will know what to show you when you need it. So, for example, the left panel gives you controls for starting up, and once underway, displays your ongoing options. The best way to communicate with the Air will be with your voice, just as you would with Siri. And as the car learns your routine, it can give you the best routing to your destination, remind you about stops you should make, and basically, act like the computers in Star Trek. The goal is to keep your phone in your pocket and your eyes on the road. The maximum capability with the minimum effort is the aim here—connected, natural, and adaptive. The Air will debut ready for autonomous driving, but you’ll have a manual mode and a co-pilot intermediate step, where the handsome center portion of the instrument panel will show you what’s happening so you can intervene if it’s necessary. I rode in a test vehicle on a closed track and saw how the car knows where it’s going, turns on its turn signal by itself, and shows you what’s going on. The view in the instrument panel screen changes depending on whether you’re driving or it’s doing the work. As a driver, you’ll see supplementary information, like a bird’s eye view, but while it’s driving, you’ll see what the car sees. You can change the look and feel of the screens too. And, there is a flat iPad style panel that angles out down low for detailed views and entering information, as needed. Push a button to retract it. Sweet. The clean, subtle style of the interior is exemplified in the way the 29 speakers in the high-end audio system are incorporated in, subtly hidden in the panels, without garish or clashing grilles. And there’s active noise cancelling, so in this nearly silent EV, you’ll hear everything the music can provide. The car looks like a futuristic version of a full-size sedan. Derek Jenkins, the designer, used his talents before at Mazda, a small Japanese company known for its clean, expressive designs. In the Air, Jenkins has produced a vehicle with subtle surface transitions and some surprises. The nose, for example, uses ten little headlamps on each side. Each tiny rectangle contains 4,820 individual lenses, like an insect’s eye, and each uses a gimbal to move with the car as it turns. They were going for a look different from the “two eyes” we’re accustomed to. Below the lighting strips, behind a cover, are the radar, lidar, and cameras needed to permit autonomous driving. And the shape creates a vortex of air to cool the motor components. Lucid believes that California provides the perfect blend of technical innovation and the spirit and emotion of life there. So, the designers, led by Sue Magnusson, have chosen California-based interior themes, including Lake Tahoe (warm oranges) and Santa Monica (bright, sunny whites), Mojave at night (dark shades) and Santa Cruz. I got to experience the four themes not only by touching material samples and conversing with friendly Lucid folks, but by sitting in a solitary seat and wearing Virtual Reality goggles. These themes will be knockouts in real life—I got to see Santa Cruz in the debut sample car. The nearly all-glass roof above each theme is astounding, too. Part of the vision for the Air is of air travel in an executive jet, blended with clean interior design, like a spacious, relaxing room. In opposition to today’s complex, busy lines, the exterior and interior of the car are elegant and refined. And the rear seat is configurable as a limo-like bench or as a pair of reclining chairs. The chairs lean way back, and from there you can look right up through the nearly all-glass roof. And with the ultra-spacious interior, the dash panel looks a half mile away. How did they get S-Class accommodations inside an E-Class body? Super-efficient packaging. In a fascinating discussion with David Mosely, Director, Powertrain, I learned about the extremely compact motors, one at each end of the car, that are small enough to fit under your arm (although I imagine they’re quite heavy). Positioning them carefully, along with a new compact type of differential and cooling system, allows for front and rear trunks. Damian Harty, the Director of Chassis Engineering, gave me a tour through the suspension’s various aluminum pieces, each of which fits carefully around the structural components near it. It’s ingenious, and beautiful, too. How about performance? The two small motors, plus a carefully configured battery that fits beneath the car, deliver a hearty 600 horsepower, good for a 2.5-second zero-to-60 time. The standard 100 kWh battery should provide 300 miles of range while the optional 130 kWh battery is expected to deliver 400 miles. The battery is not a monolith but a carefully shaped essential element of the car. It’s shaped to allow extra legroom for the very comfortable rear-seat passengers. Safety? I viewed a rugged looking body structure that uses top grade aluminum and is designed to deform perfectly in a crash. The advanced safety systems should ensure that that happens very rarely, though. Lucid plans to produce its cars in a new, state-of-the-art factory in Casa Grande, Arizona, set to break ground in the middle of 2017. It’ll be a sprawling facility someday, but the plan is to roll it out in three phases. Then, as more capacity is needed, they’ll just expand to fill the space. That saves a lot of startup cost while leaving room to grow along with future volume. By 2022, it should employ 2,000 workers. Peter Rawlinson, Lucid’s chief technical officer, designed the Tesla Model S and has worked with Lotus and Jaguar. Rawlinson told me the goal with the Air is to create one exquisite and high-priced model, at around $100,000. However, as costs go down and volume goes up, Lucid will be able to offer versions at closer to $65,000. That’s what Henry Ford with the Model T prices, although the two cars couldn’t be more dissimilar. The employees I spoke with at Lucid all told me about the close collaboration they enjoyed with each other while developing the Air. Designers and engineers were collocated, for example, so styling and technical design could communicate throughout the process. The Lucid Air itself then, with it’s perfectly coordinated components, reflects the team of 300 people who created it. As wait for my Chevrolet Bolt to arrive, I’ve joined two Facebook Chevrolet Bolt groups and other forums. I’m learning more about how cars are built. I’ve ordered two cars before. The first was my Saturn, back in 1990, and I heard nothing until it was there to pick up. I think I may have simply received a car that matched my request, rather than having it custom assembled for me at the factory. Another time, I ordered a car for my wife. They said it would be two months and it ended up being six weeks. But I never had any idea of the flow. So, in this day of instant information, I was expecting to hear from my salesman that my car was getting loaded on the truck and was on its way. But so far, no news. Then, I read on a forum about the Chevrolet Live Chat line, and tried that. Presto! In a few seconds I found out that my car, with its six-digit alphanumeric ID number, was in the Broadcast status–meaning they have set up the computer at the plant to build it. The Targeted Production Week (TPW) is next week–12/12/16. I signed up to get weekly updates, too. I’m a little disappointed, because that means the car could arrive in January, but there’s really nothing I can do about it. I didn’t put the absolute first order in (my salesman said he had a bunch of them already), so I’ll just wait. There’s not really any rush, is there? There’s a lot of talk about the Bolt, with it winning awards and all. I’ve even see the electric billboard on my commute showing it as the Motor Trend Car of the Year winner! But I’m personally feeling anxious for it to get here. I sure don’t want them to rush it, though. And what if they build it tomorrow? Isn’t “made on a Monday” bad luck? (just kidding).